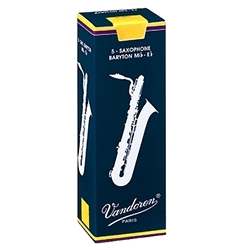 Vandoren Traditional series baritone sax reeds are characterized by a thin reed tip. The result is a quality of pure sound that is balanced by a solid vertical column. A French-style file cut further distinguishes these reeds. They are among the most popular in the world and are great for all-around use, and are popular with classical and jazz musicians, and with students and professionals alike.